A stunning literary survival story, hailed by the Los Angeles Times as a "moving, beautifully written account, by turns raw and tender." Across Sudan, between 1987 and 1989, tens of thousands of young boys took flight from the massacres of Sudan's civil war. They became known as the Lost Boys. With little more than the clothes on their backs, sometimes not even that, they streamed out over Sudan in search of refuge. Their journey led them first to Ethiopia and then, driven back into Sudan, toward Kenya. They walked nearly one thousand miles, sustained only by the sheer will to live. 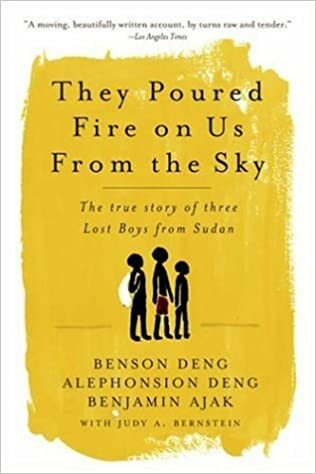 They Poured Fire on Us from the Sky is three boys' account of that unimaginable journey. With the candor and the purity of their child's-eye-vision, Alephonsion, Benjamin, and Benson recall by turns how they endured hunger and strength-sapping illnesses. How they dodged the life-threatening predators-lions, snakes, crocodiles and soldiers-that dogged their footsteps. How they grappled with a war that threatened continually to overwhelm them. Their story is a lyrical, captivating portrait of a childhood lost to war, and of the perseverance of the human spirit.